Download "Scheduling Glossary Activity. A component of work performed during the course of a project." 3 material, people, equipment or supplies required to perform each activity. Fast Tracking. 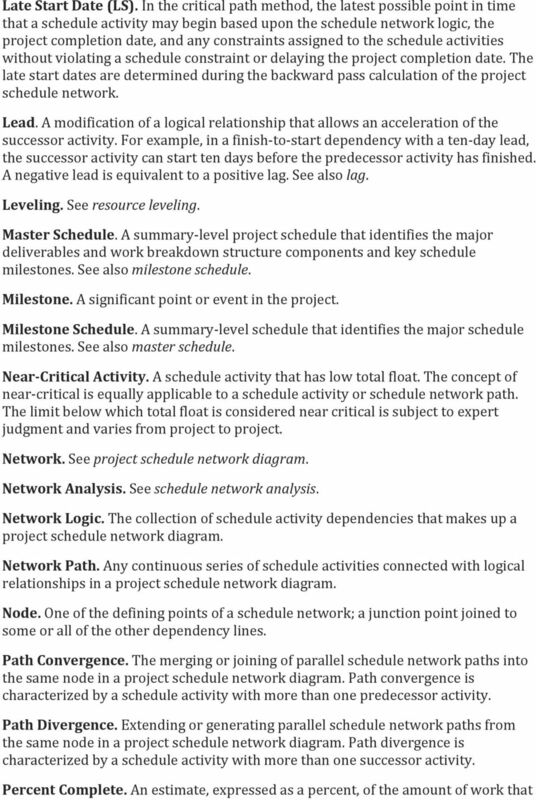 A specific project schedule compression technique that changes network logic to overlap phases that would normally be done in sequence, such as the design phase and construction phase, or to perform schedule activities in parallel. See also crashing and schedule compression. Finish Date. A point in time associated with a schedule activity s completion. Usually qualified by one of the following: actual, planned, estimated, scheduled, early, late, baseline, target, or current. Finish- to- Finish (FF). The logical relationship where completion of work of the successor activity cannot finish until the completion of work of the predecessor activity. See also logical relationship. Finish- to- Start (FS). The logical relationship where initiation of work of the successor activity depends upon the completion of work of the predecessor activity. See also logical relationship. Float. Also called slack. See total float and free float. Forward Pass. The calculation of the early start and early finish dates for the uncompleted portions of all network activities. See also schedule network analysis and backward pass. Free Float. The amount of time that a schedule activity can be delayed without delaying the early start date of any immediately following schedule activities. See also total float. Gantt Chart. A graphic display of schedule- related information. In the typical bar chart, schedule activities or work breakdown structure components are listed down the left side of the chart, dates are shown across the top, and activity durations are shown as date- placed horizontal bars. Imposed Date. A fixed date imposed on a schedule activity or schedule milestone, usually in the form of a start no earlier than and finish no later than date. Lag. A modification of a logical relationship that directs a delay in the successor activity. For example, in a finish- to- start dependency with a ten- day lag, the successor activity cannot start until ten days after the predecessor activity has finished. See also lead. Late Finish Date (LF). 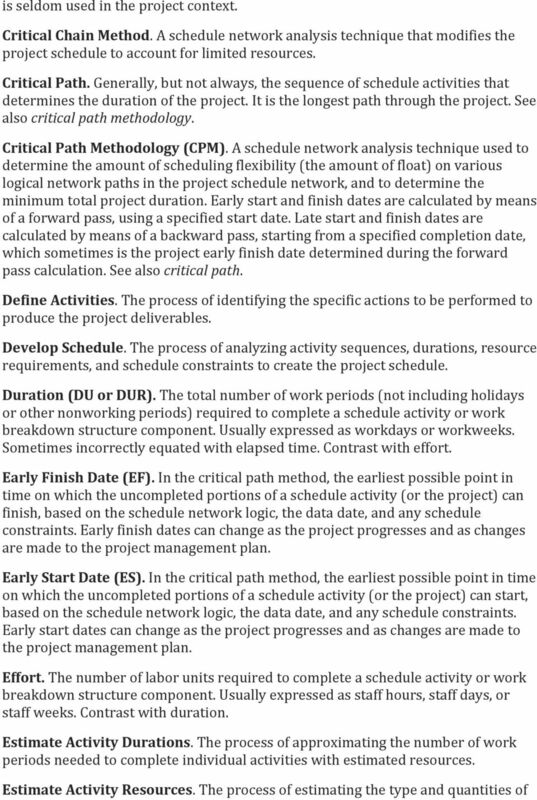 In the critical path method, the latest possible point in time that a schedule activity may be completed based upon the schedule network logic, the project completion date, and any constraints assigned to the schedule activities without violating a schedule constraint or delaying the project completion date. The late finish dates are determined during the backward pass calculation of the project schedule network. 5 has been completed on an activity or a work breakdown structure component. Precedence Diagramming Method (PDM). A schedule network diagramming technique in which schedule activities are represented by boxes (or nodes). Schedule activities are graphically linked by one or more logical relationships to show the sequence in which the activities are to be performed. Precedence Relationship. The term used in the precedence diagramming method for a logical relationship. In current usage, however, precedence relationship, logical relationship, and dependency are widely used interchangeably, regardless of the diagramming method used. See also logical relationship. Predecessor Activity. 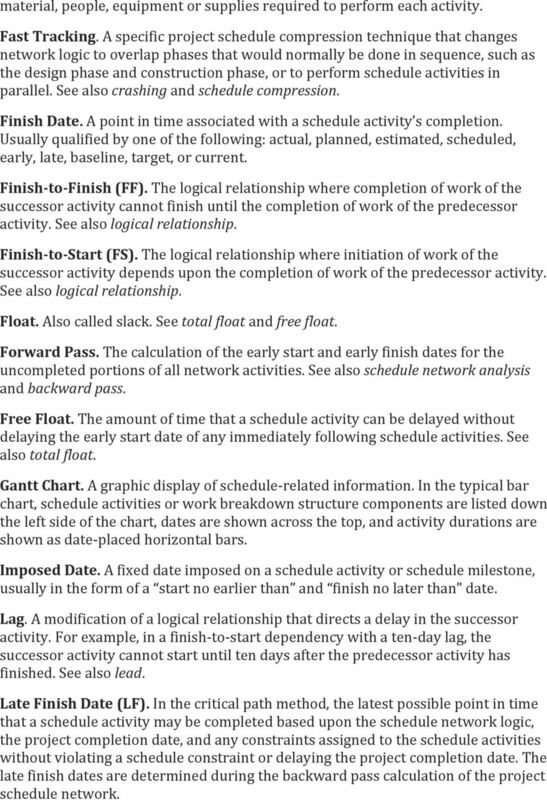 The schedule activity that determines when the logical successor activity can begin or end. Program Evaluation and Review Technique (PERT). A technique for estimating that applies a weighted average of optimistic, pessimistic, and most likely estimates when there is uncertainty with the individual activity estimates. Project Calendar. A calendar of working days or shifts that establishes those dates on which schedule activities are worked and nonworking days that determine those dates on which schedule activities are idle. Typically defines holidays, weekends, and shift hours. See also resource calendar. Project Schedule. The planned dates for performing schedule activities and the planned dates for meeting schedule milestones. Project Schedule Network Diagram. Any schematic display of the logical relationships among the project schedule activities. Always drawn from left to right to reflect project work chronology. Reserve. A provision in the project management plan to mitigate cost and/or schedule risk. Often used with a modifier (e.g., management reserve, contingency reserve) to provide further detail on what types of risk are meant to be mitigated. Reserve Analysis. 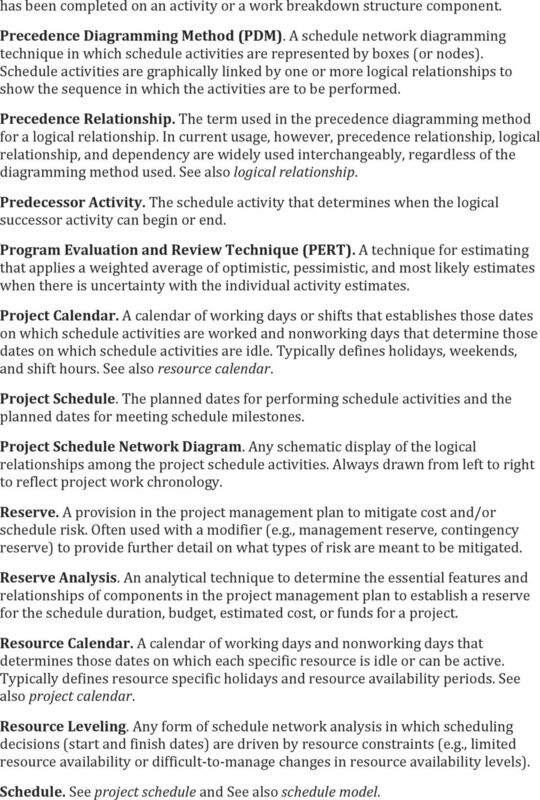 An analytical technique to determine the essential features and relationships of components in the project management plan to establish a reserve for the schedule duration, budget, estimated cost, or funds for a project. Resource Calendar. A calendar of working days and nonworking days that determines those dates on which each specific resource is idle or can be active. Typically defines resource specific holidays and resource availability periods. See also project calendar. Resource Leveling. Any form of schedule network analysis in which scheduling decisions (start and finish dates) are driven by resource constraints (e.g., limited resource availability or difficult- to- manage changes in resource availability levels). Schedule. See project schedule and See also schedule model. 6 Schedule Baseline. A specific version of the schedule model used to compare actual results to the plan to determine if preventive or corrective action is needed to meet the project objectives. Schedule Compression. 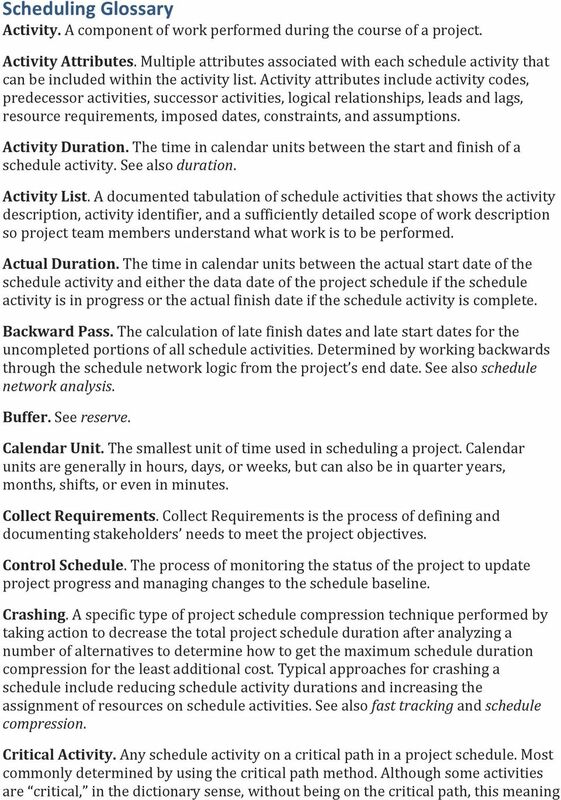 Shortening the project schedule duration without reducing the project scope. See also crashing and fast tracking. Schedule Network Analysis. 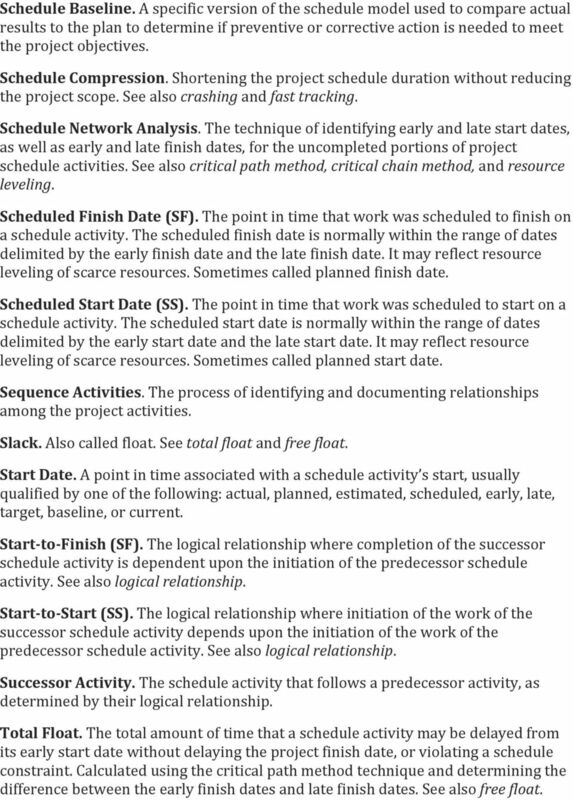 The technique of identifying early and late start dates, as well as early and late finish dates, for the uncompleted portions of project schedule activities. See also critical path method, critical chain method, and resource leveling. Scheduled Finish Date (SF). The point in time that work was scheduled to finish on a schedule activity. The scheduled finish date is normally within the range of dates delimited by the early finish date and the late finish date. It may reflect resource leveling of scarce resources. Sometimes called planned finish date. Scheduled Start Date (SS). The point in time that work was scheduled to start on a schedule activity. The scheduled start date is normally within the range of dates delimited by the early start date and the late start date. It may reflect resource leveling of scarce resources. Sometimes called planned start date. Sequence Activities. The process of identifying and documenting relationships among the project activities. Slack. Also called float. See total float and free float. Start Date. A point in time associated with a schedule activity s start, usually qualified by one of the following: actual, planned, estimated, scheduled, early, late, target, baseline, or current. Start- to- Finish (SF). The logical relationship where completion of the successor schedule activity is dependent upon the initiation of the predecessor schedule activity. See also logical relationship. Start- to- Start (SS). The logical relationship where initiation of the work of the successor schedule activity depends upon the initiation of the work of the predecessor schedule activity. See also logical relationship. Successor Activity. The schedule activity that follows a predecessor activity, as determined by their logical relationship. Total Float. The total amount of time that a schedule activity may be delayed from its early start date without delaying the project finish date, or violating a schedule constraint. Calculated using the critical path method technique and determining the difference between the early finish dates and late finish dates. See also free float.